Weather was perfect! Met Jan with my non-seafaring husband and my 18 yr. old experienced sailor dtr. and myself who has had lots of ocean experience over the years. I REALLY needed my hubby to have a good experience so we can kayak as a hobby..I already love it! Laura and I expected to be bored and it didn't happen! Jan kept us busy learning paddle strokes and safety,and other stuff specific to kayaking...We learned a lot...then we got in the water...Beautiful...Jan showed us how to do everything PROPERLY! What a difference! You just feel stronger and more competent when you do things right! AND the Beauty of it all! 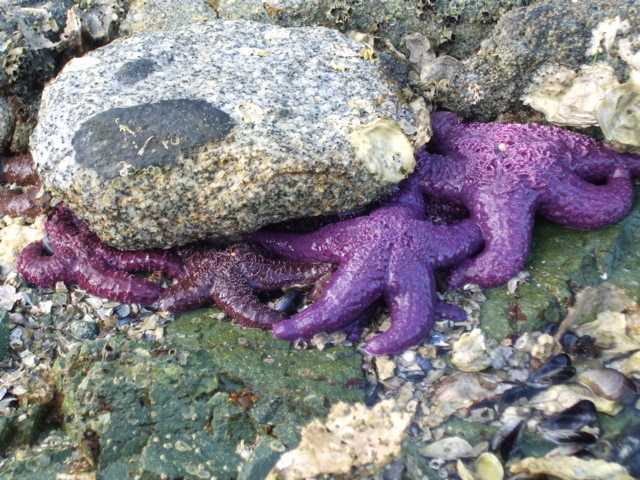 Herons, eagles, starfish AND SEALIONS! they surfaced right by our boats...Us girls were thrilled, hubby was awed! So what I needed him to see! and he loved it! We will be back for the extended course! 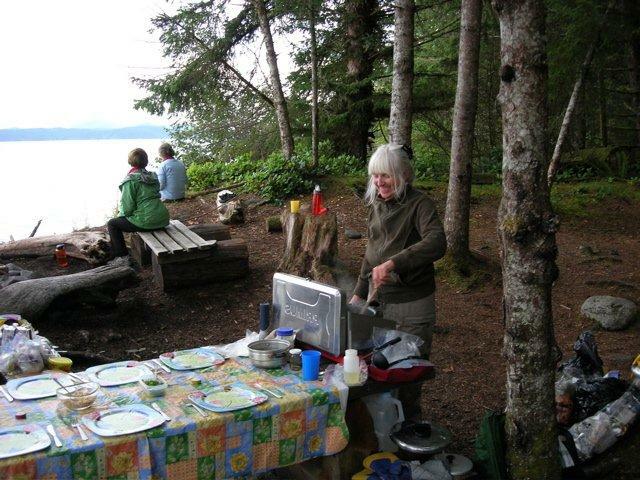 Jan was an awesome teacher, knowledgeable and welcoming to all ages! Way exceeded our expectations of a 2 1/2 hour course...and the price was right to! 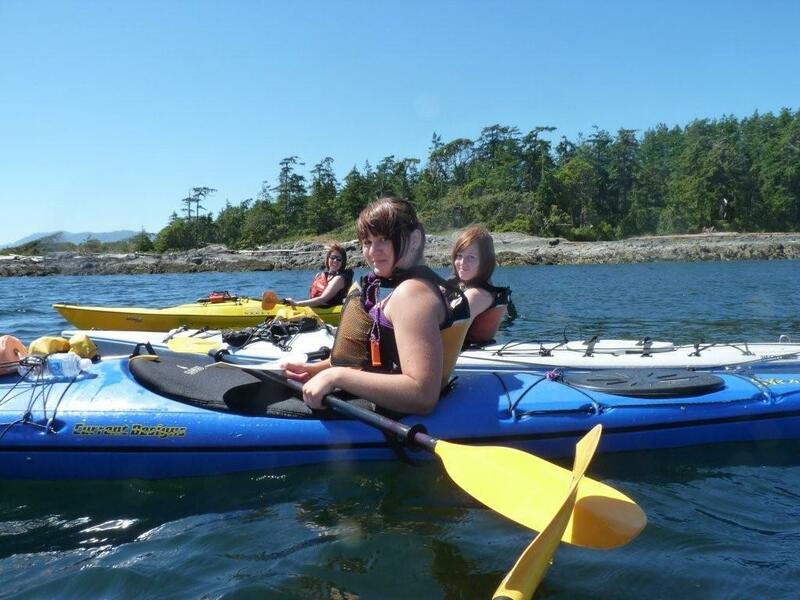 Adventuress offers fun, introductory kayaking lessons, a full day certified course for beginners and new this year Rescue & Safety Clinics and weekend-long Paddle Canada Level 1 certifications. Everyone is invited… young and old, men and women.. no experience is necessary, absolute beginners are welcome. See the selections below and find what suits ya’ best! Discover Kayaking … a 2.5 hour gentle introduction to kayaking… perfect for those who wish to learn a few basics and have a paddle around the bay. See below for more info. 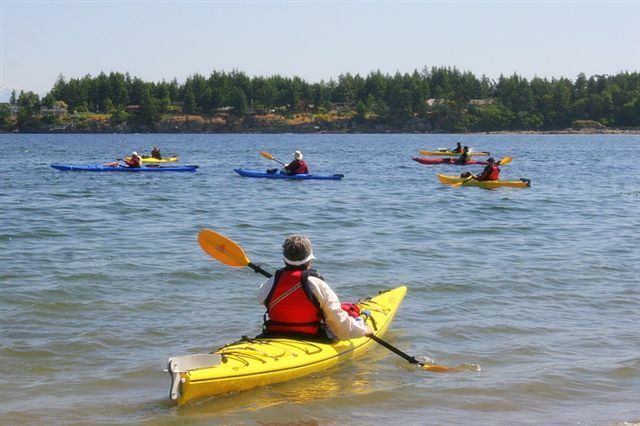 Paddle Canada Certified Basic Sea Kayaking Course for Beginners… for those who prefer an in-depth, solid foundation in sea kayaking and receive a certification. This is a full day course. See below for more info. Paddle Canada Certified Level 1 Sea Kayaking Course.. for those who already have their Basic certification or applicable skills, knowledge and experience… come join us for a full weekend of more skills & knowledge, more on-water practice and more fun! Rescue & Safety Clinics… for those who have taken previous training and want to practice their re-entry skills and learn new techniques. Or for those who simply wish to join us for the first time, get ready for the paddling season, and practice, practice, practice! See below for more details. Everyone welcome! Seamanship and Trip Planning Course for Paddlers … especially designed for kayakers who wish to delve into more topics including weather, navigation, chart reading, tides & currents and start planning their own trips. More details here. 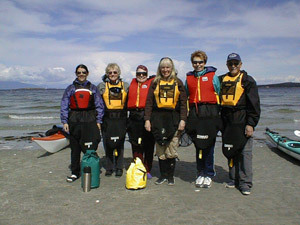 Women in the Wild Kayaking Adventure! For women who want to come out on the high seas for a multi-day adventure but it seems a daunting task. This 5 day in-depth course and paddling adventure will give you the skills, knowledge and confidence to kayak, camp, and explore the fabulous Broken Group Islands. Certification in Paddle Canada Basic or Level 1 is included upon successful completion. More details here. Adventuress can come to you! If you have a group who wishes to be instructed, call us and we would be happy to bring the boats and gear to your surroundings. Adventuress teaches the Paddle Canada Basic introductory class, a nationally accredited course for recreational paddlers. This 8 hour course is taught by a certified Paddle Canada instructor. There are no kayaking prerequisites for this class; complete beginners are welcome! Upon successful completion, the participant will receive a certificate from Paddle Canada. This basic sea kayaking course is jam-packed full of information and time on the water. It is perfect for beginners who wish to get a solid foundation in the art of sea kayaking. For those who have some experience in kayaking, this is a way to enhance your skills, learn new techniques, and feel more confident. This course comes with an in-depth manual. “Hi Jan: I want to thank you for your patience and great guidance in our course yesterday. I found your course very thorough. Your guidance was solid and you made sure we all did our stokes properly and knew exactly what we need to practice to get the strokes right. Your other information was well understood by me and examples made a definite point. I feel I made the best choice in booking my introductory course with you. I am so happy that I took the course with you and I feel more confident on the water because of all your help. Keep up the good work and I will be recommending others to your courses.” Laurie P.
Dates for 2019: April 20, May 26, June 8, July 7, July 20, August 3, August 31, Sept. 15 or call to book your group. At times additional dates are added as the classes fill up, so be sure to e-mail if these dates don’t work for you or if you have a group and wish to do private lessons. * Kayaks and gear (lifejacket with whistle, paddle, spray skirt, tow rope, pump) for the full day course can be rented for $25.00 + 5% gst per person. Just let us know and we’d be happy to assist you. This Level 1 course is geared for those with their Basic certification and want to take their skills and knowledge up a notch. This class is taught over a weekend so you can immerse yourself in your on-water practice and upgrade your skills in navigation, weather, tides and currents, and trip planning. This in-depth class builds on the skills of the Basic course and adds on more paddle strokes, rescues and seamanship knowledge. You are expected to perform at a higher level on this course than the Basic. To bring all the elements together, you will design and carry out a half day kayaking trip using all your level 1 on-water and navigation/trip planning skills. Length: 16 hours 8:30 a.m. – 5:30 p.m. Dates for 2019: May 18 & 19, June 29 & 30, July 30 & 31, August 10 & 11, and September 21 & 22 . At times additional dates are added as the classes fill up, so be sure to e-mail if these dates don’t work for you or if you have a group and wish to do private lessons. * Kayaks and gear (lifejacket with whistle, paddle, spray skirt, tow rope, pump, paddle float) for the Level 1 course can be rented for $25.00 + 5% gst per person. Just let us know and we’d be happy to assist you. AND enjoy a mini paddle. Dates for 2019: April 13, May 12, June 9, July 6, August 4, August , Sept. 7 or call to book your group. Bring your family and friends and run your own private course for the same price or enquire for a different date that is not listed. Call 250.755.6702 or e-mail adventuress@shaw.ca to reserve and receive all the details of launch location, what to wear and bring, etc. These clinics, taught by a certified Paddle Canada instructor, are designed to maximize your time on the water practising, learning new skills and keeping you safe. You never know when that rogue wave is going to sneak up on you and all of a sudden, you are in the water! Don’t wait for that to happen before you take this course. It is important to practice re-entries every year to keep it fresh and know how to respond quickly to your or a paddling buddy’s capsize. Bring a friend or spouse and practice together. You can never do enough of these. 7 rescue techniques… we show ’em, you practice them! Pick your favourites and nail down those techniques. Contact tow – getting someone out of danger fast! Kayak check… is your boat outfitted properly? Dates for 2019: Saturday, May 25, Saturday, June 15, Sunday, July 28, Saturday, August 24th, Saturday, Sept. 14. * Kayaks and gear (lifejacket with whistle, paddle, spray skirt, tow rope, pump, paddle float) can be rented for $25.00 + 5% gst per person. Just let us know and we’d be happy to assist you.